Malaysia Today, the hard-hitting news website edited by Raja Petra Kamarudin, has been blocked by mysterious technical problems twice in the last 24 hours after publishing damning articles of deep corruption at the top of the Malaysian government. One implicated the United Malays National Organization, the country's leading political party, in looting MAS, the country's flag carrier. A second alleged that a friend of Prime Minister Najib Tun Razak was attempting to steer RM200 million into the pockets of Najib's family from China Railways Engineering Corporation (CREC), for double-tracking the national railway. "We are under severe attack," Raja Petra said in an email from London, where he now lives. "We've been down for the last 12 hours and a day before that for 24 hours. Looks like someone is spending a lot of money to keep us off the air." The website's technology personnel restored access, only to have it disappear again. "It was the MAS story," Raja Petra said. "The site was brought down just a few hours after that. 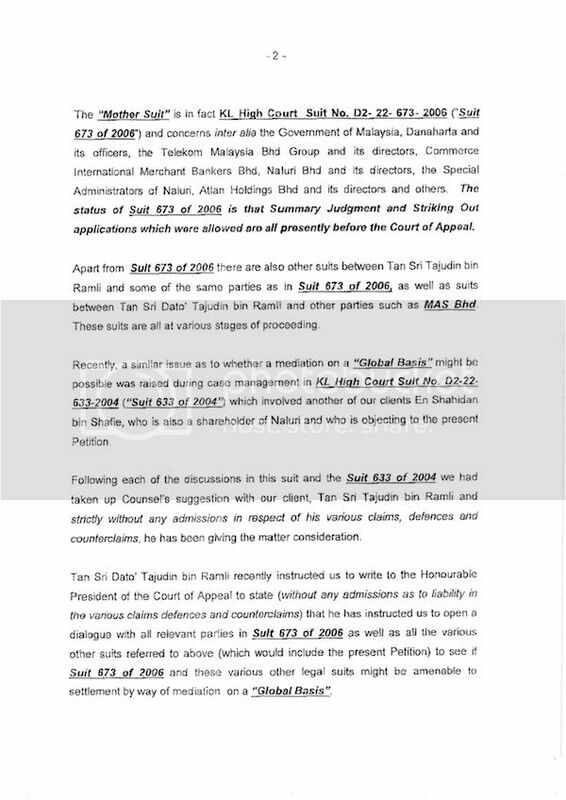 We revealed documents to and from the court to compromise the MAS case against Tajudin Ramli." The fugitive editor was forced to flee the country 18 months ago after being charged with criminal defamation of Najib and his wife, Rosmah Mansor, and being threatened with prosecution under the country's stiff Internal Security Act, which allows for what amounts to indefinite detention without or trial. It wasn't clear who was doing the blocking, but whoever it is must be learning that the Internet is a sieve. The offending stories almost immediately appeared in another anonymous blog called "Malaysians Must Know The Truth." Despite the fact that Malaysian bloggers have developed a healthy opposition press delivering voluminous details of government wrongdoings that can't be read in the government-controlled press, so far the Internet has remained free of interference. 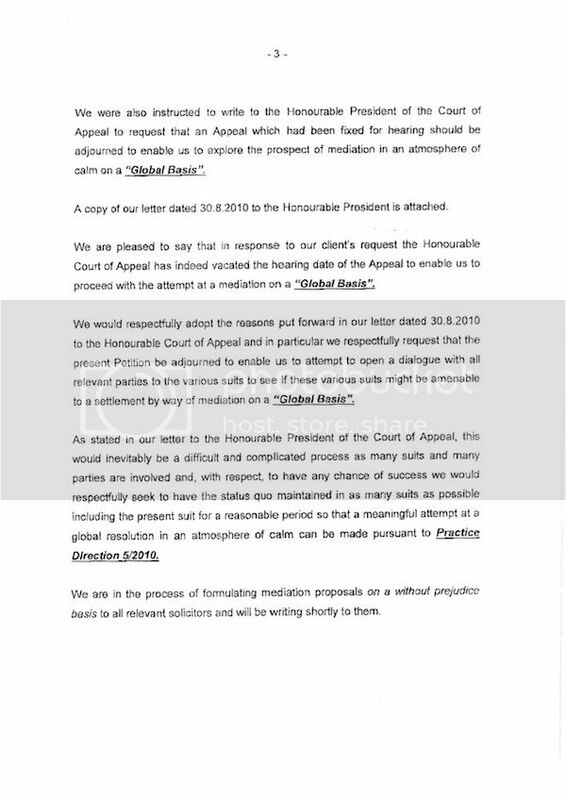 Government leaders have repeatedly denied any intention to shut down the bloggers. Over recent weeks, however, Raja Petra has been particularly hard-hitting with a series of articles based on verbatim documents concerning the misdoings in MAS. 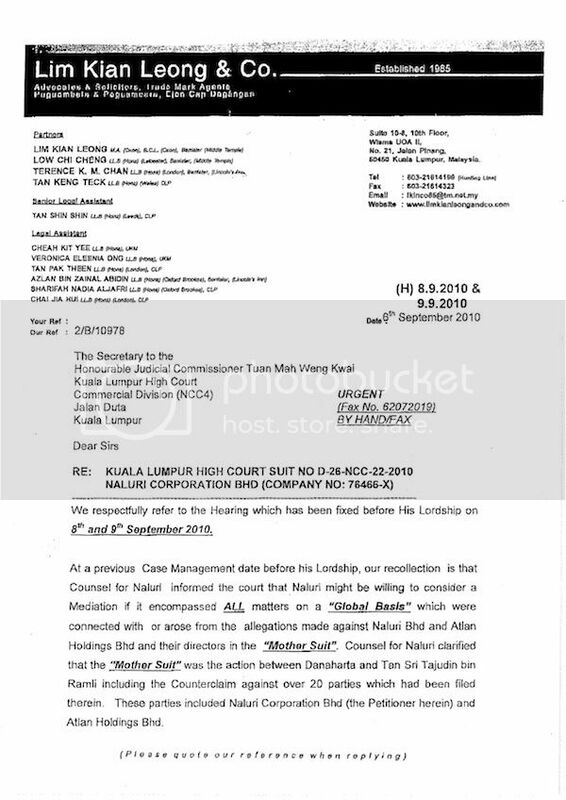 The Asia Sentinel, in an Aug. 24 article using the same documents, wrote that Tajudin Ramli, a crony of former Prime Minister Mahathir Mohamad, was accused of looting the airline of tens of millions of dollars and very nearly putting it into bankruptcy by investigators who themselves then faced a campaign to discredit them. The airline, which had been privatized and turned over to Tajudin, had to be rescued by the government. After it had incurred RM8 billion in losses, Tajudin returned the airline to the government for almost the original price, the losses notwithstanding. 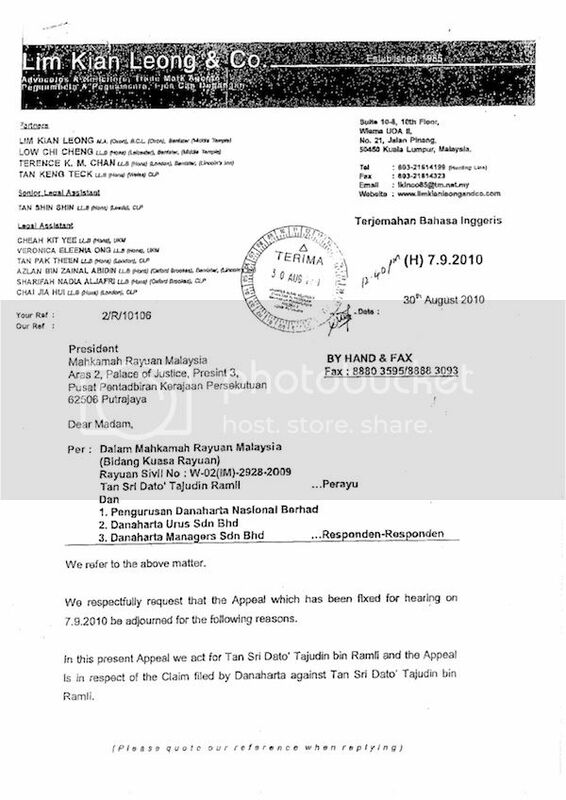 Raja Petra continued to write about the issue, culminating in an article on Sept. 8 in which he said Tajudin had been given immunity by UMNO with the backing of former Prime Minister Abdullah Ahmad Badawi and that reports by investigators and whistle-blowers went unheeded by the police. 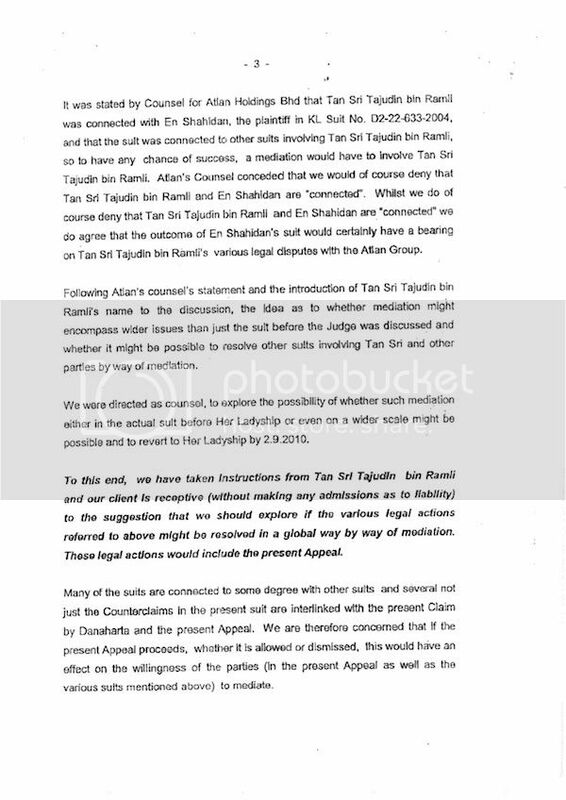 In the article, Raja Petra said he had been visited by Tajudin's lawyers in London, who told him that he had only been a front man for UMNO and that UMNO "not only has to protect him from prosecution but that they also had to ensure that the government bought back the shares at the same price that they were sold to him although the shares were only worth a portion of the real value." According to the article, which is printed here, "This was going on not only for MAS but for other deals as well." 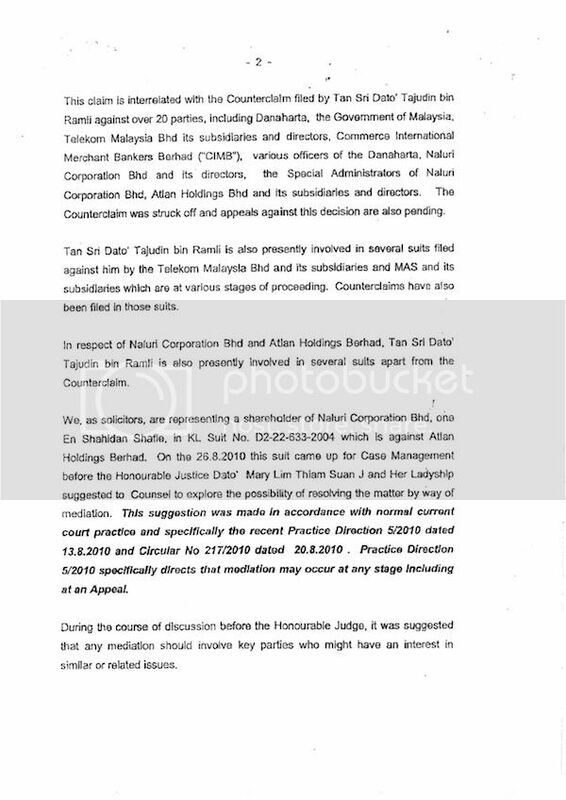 The depositions listed a long series of documents detailing misdoings in UEM/Renong, an UMNO-linked construction company once headed by Halim Saad, another Mahathir crony, which has long been accused of looting the government treasury through vastly overpriced construction contracts. "These are all Tajudin's allies working in concert to now spill the beans. They were all Umno front men and nominees. And they all now have an axe to grind with Tun Dr Mahathir Mohamad," Raja Petra wrote. "And, more importantly, it appears like the current Prime Minister, Najib Tun Razak, is giving his tacit approval for Tajudin Ramli, Rahman Maidin and Halim Saad to sing like a canary and finger UMNO, Dr Mahathir and Tun Daim Zainuddin as the real rogues behind the plundering of billions of ringgit of taxpayers' money." That wasn't all. On Sept. 5, Malaysia Today posted an article alleging that Tan Kay Hock, the controlling shareholder of Johan Holdings Bhd, a publicly-listed investment holding company and golfing partner of the prime minister had asked Chinese officials who had contracted to double-track the national railway for RM500 million and told them that RM200 million is for Najib's family. "And this is making the Chinese very unhappy because, in China, both the givers as well the sis charged to the family of the deceased," Raja Petra wrote. "The Chinese are wondering whether it is worth the risk to pay Kay Hock the RM500 million he is demanding." 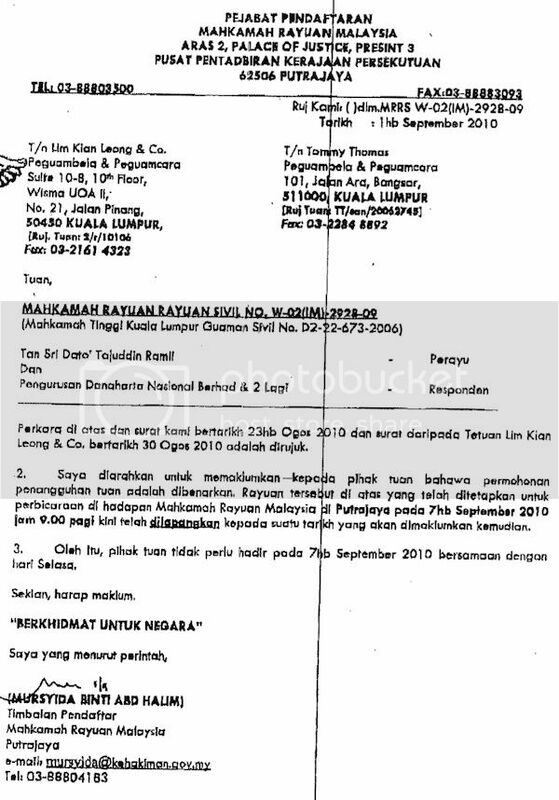 The national railway, he wrote, "is being used as Najib's new cash cow." A deal to supply coaches worth RM1.4 billion went to a company involving Najib's wife Rosmah and two other women, Raja Petra alleged. The coaches were said to be worth only RM300 million and do not function, he said. 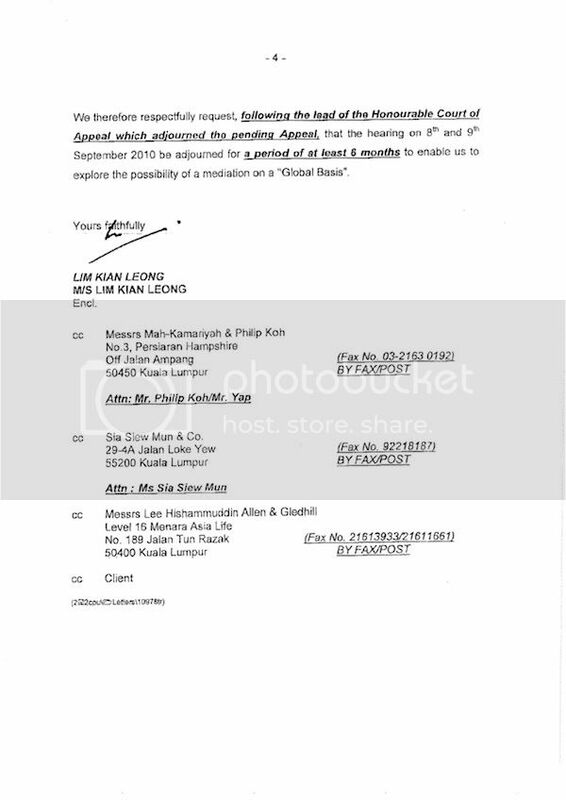 The documents referred to by Malaysia Today are listed below.